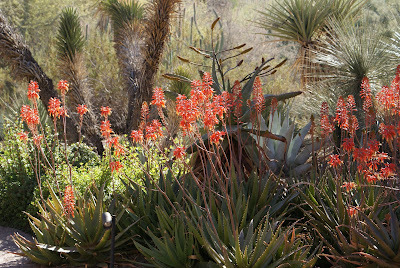 I'm going to end the month of January with this lush cluster of blooming aloe that I found recently at the Desert Botanical Garden. I love how those red blooms glow in the sun. Over the last two days, I've pictured two different prickly pear cactus. Now compare those two with this thorny one. I'm not sure of the official name for this one, but with those long, bold thorns, this one is completely different from the two I pictured before. Regardless of whether the cactus has long, thick thorns, or tiny, microscopic thorns, it's a good idea not to get too close to either kind. Compare yesterday's cactus with this one adorned with red glochids. This one is called Optunia Rufida and it belongs in the same family as yesterday's Bunny Ears Prickly Pear. It might look softly fuzzy, but you don't want to get any of those tiny glochids caught in your skin. 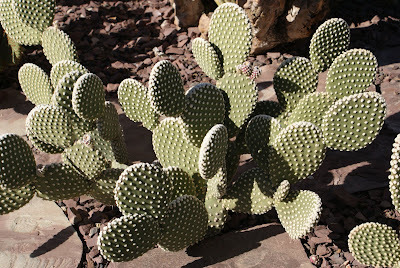 I've had several different types of prickly pear cactus on this blog before. 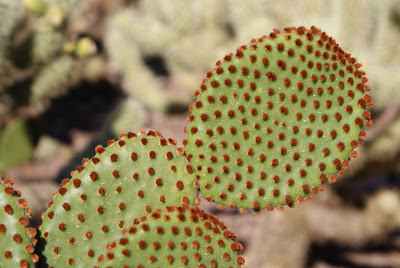 Today I'm showing you one that is called Bunny Ears Prickly Pear. Its official name is Optunia Microdasys. Instead of having thorny spines, it has something called glochids which are tiny, finely barbed, hair-like spines in little clusters. The glochids are easily detached and can lodge in the skin causing considerable irritation and discomfort. In spite of that danger, they certainly are nice to look at with their polka-dotted texture. Walking along a path at Encanto Park, I kept hearing an odd rapid rat-a-tat-tat noise. I looked up and saw this woodpecker tapping away on this lamp post. When I got a little too close, he flew off to try his beak on the next street light. These geese seem to be enjoying the puddles left behind by all of the rain we had last week. The weather last week might have been a little wet for us desert dwellers, but it was perfect for these ducks. This past week has been very gray and rainy culminating in a storm on Thursday that dumped a record amount of rain and snow over Arizona's normally dry landscape. After several days of rain, we are treated to these large cotton-like islands floating in the sky over Camelback Mountain. This sculpture of a boxer sits in front of the Camelback Village Racquet & Health Club in Phoenix. There is no indication of who the artist is. This Mediterranean-style office building is the home of the Virginia G Piper Charitable Trust. Mrs. Piper was the widow of the founder of Motorola, Paul Galvin who died in 1959. She later married Motorola executive, Ken Piper. Throughout her life she involved herself in philanthropic works in the areas of arts, medical research, childhood development, and family services. She founded the trust in 1995 and appointed four lifetime trustees to oversee the work of the foundation. Virginia passed away in 1999, but the trust continues to support many non-profit organizations in Arizona. This lion's head serves as a decorative fountain head. Tomorrow I'll show you where I found him. Last July I told you about the Two Hippies Beach House, an eating place that serves delicious tacos. Those same two hippies also own this burger and hot dog shop. This place also gets rave reviews for both the burgers and the hot dogs. I haven't tried them yet, but I will. I love the giant hot dog on the roof. I've noticed this painting on the side of a building that has been undergoing some remodeling for the past few months. I am guessing from the painting that this will one day be a coffee house. Construction appears to be stalled at the moment, but I do enjoy seeing this painting. The PF Chang's Rock 'n' Roll Marathon passed very near my house in the early hours of Sunday morning. I took the opportunity to snap a few photos of the event on this cloudy morning. I put a few of them into this little collage. I was completely amazed by the numbers of runners. I stood on the corner for an hour while the thick crowds of runners whizzed by me. Most of the runners were serious about their athletic skills, but there were also quite a few who were out for a good time. 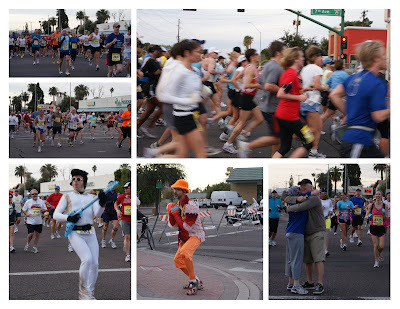 The Elvis impersonator running with his 'air' guitar was a favorite. There was a great band playing on the corner where I was standing and the fellow in orange leapt out of the crowds of runners to do a little impromptu dance in front of the band stand. Still others greeted loved ones cheering them on from the sidelines. I found yesterdays photo at this small complex of condominiums. What an interesting use of metal fabrication with rust accents. Lines and angles that caught my eye. Tomorrow I'll show you where I found these lines. I think my dragonfly photo what the best of 2009. I took this back in May while visiting the Desert Botanical Gardens. The Chihuly exhibit was nearing its end and the garden was full of people trying to capture the beauty of the exhibit before it was gone. 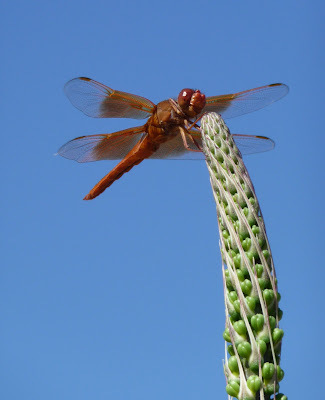 I spotted this dragonfly flying around this tall plant and I started snapping and hoping for the best. The newest addition to the Phoenix Zoo is the Komodo dragon from the islands of Indonesia. He's a big fellow. I've been to the U. S. Airways Arena many times, usually joining my friend Janet for an exciting basketball game, but I had never noticed this giant electrical plug before. Maybe that's because on game nights, the arena is so full of people it's hard to see anything else. This is a great advertising gimmick for our local electricity provider, Arizona Public Service. It looks to me like they are using "Suns Power" to keep the lights on in the arena. Meet Al McCoy, the voice of the Phoenix Suns Basketball Team. He's addressing the group at the "Legends" breakfast last week at the U. S. Airways Arena. This was an event to honor season ticket holders who have supported the team for 40 years. I have close friends who fall into that group and I was lucky enough to be invited to join my good friend Janet at the breakfast event. Thank you Janet!! In the small photo, you see Al getting questions from the group. The breakfast was set up in the lobby of the Arena near where the ticket office is located. Tomorrow I'll show you another photo I took while I was at the arena. I spotted this car in the parking lot of the Arizona American Italian Club featured in yesterday's post. Such a combination of nationalities going on here. Christopher Columbus stands in front of the Arizona American Italian club in north Phoenix. This clever little bird is looking right into the camera! I'm not sure what has caused these stains on this prickly pear, but they look a lot like watermarks on paper. At every festival or street fair, you will always find a vendor selling Kettle Korn and filling the air with its sweet aroma and the familiar popping sound. Kettle Korn is popped corn that has been popped in a huge open kettle over a gas flame. The cook stirs the corn as it's popping and adds a little sugar to make a sweet treat. There is an area at the Desert Botanical Garden called the Native American Crops Garden. Along with traditional crops from the Southwestern U.S. and Mexico, it also features examples of Native American structures. Here we had a garden fenced with ocotillo spines and behind it a shade structure made of logs and more cactus spines. Here is an unusual flower with an unusual name. It's called Big Mamma Turk's Cap and I found it at the Desert Botanical Garden. The technical name for this flower is Malvaceae. Having never heard of this flower before, I did a little research and found that it was hybridized by someone named G. Grant and it was first registered in 2005. That would make it a fairly new plant form. When I was taking yesterday's photo of Santa flying between two high-rise buildings, I was approached by a security guard who told me that taking photos was not allowed on the property. The office complex is called City Square and is composed of three high-rise buildings and a hotel. I told the guard that I was not a commercial photographer and only wanted pictures of the holiday decor. I was told it made no difference, the owners did not allow any photos to be taken of their property. Thankfully, she didn't seem to know that I had already taken several shots from a variety of locations. I tend to be a bit rebellious when it comes to silly rules that make no sense at all. After all, the property is composed of high-rise buildings. I could stand a block a way and get much more obtrusive photos than I was taking that night. So, that is exactly what I did yesterday. I drove a block away and took this photo of the two buildings in yesterday's photo only from a different direction. So, I've managed to take a photo of the forbidden. I feel so much better now. Who said reindeer can’t fly? When I first moved to Phoenix, many, many years ago, I worked directly across the street from this office complex in the midtown area. Santa in his sleigh pulled by those flying reindeer soared between these two buildings way back then and has done so every year since. It just took me all this time to get a picture of it. Yesterday I spotted these very creative holiday decorations adorning someone's yard. Now I'm wondering if they light up at night. I'm afraid I wasn't very creative for this theme. I've been having a huge amount of internet/equipment problems and combine that with the busy holiday schedule and I just couldn't think of something to post. 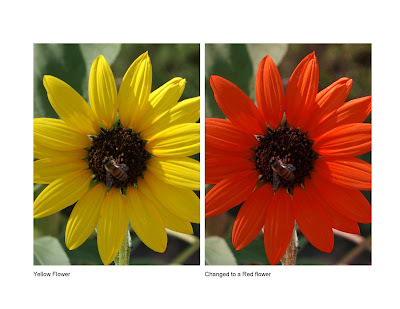 I have been trying to learn a new photo editing system lately so I give you this lovely yellow flower that I learned how to change to red. I wish I could have thought of a photo to express my wishes for a big CHANGE for the better in 2010. Here's wishing everyone a very happy new year!